Michael Jung bounced back from a dramatic early mishap to take the cross-country lead on his second horse, La Biosthetique Sam, at the Land Rover Burghley Horse Trials on Saturday. The German rider only got as far as fence 4 on his joint dressage leader, FischerRocana FST, where, to gasps from the crowd, the mare tripped and fell in the water. But he was masterful aboard his Olympic, world and European champion Sam, finishing just two seconds over time to rise seven places to first in the sixth and final leg of the FEI Classics 2014/2015. Visibly limping after he fell with Fischerrocana FST at the Lion Bridge, Jung returned several hours later with a strapped up leg and a doggedly determined look on his face. A clear round just two seconds over the optimum time left him and Sam on a finishing score of 40, giving them 1.5 penalties in hand going into Sunday’s showjumping phase. 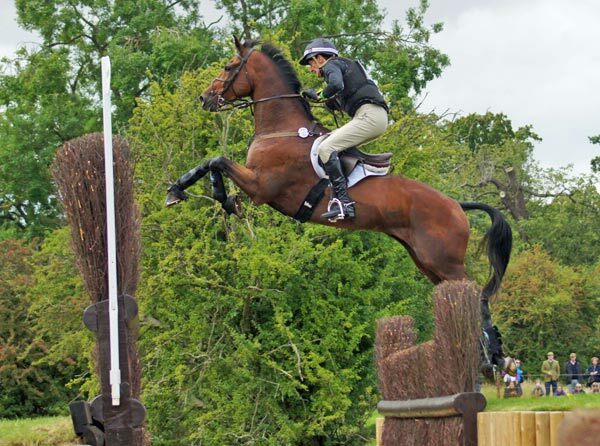 William Fox-Pitt (GBR), the joint dressage leader on Fernhill Pimms, suffered a rare lapse of concentration. He had the misfortune to be held on course before fence 23, a big spread on a downhill slope, while it was being repaired. Then, when taking the long route at the next obstacle, the Discovery Valley complex, he galloped past the second element and had to retrace his steps. New Zealander Tim Price had by far his best Burghley in five attempts and is now in second place on Ringwood Sky Boy, just 1.5 penalties behind Jung. But his day was not without drama either, as a wasp got inside his vest halfway round the course and stung him. Price had one of the fastest rounds of the day for 2.8 penalties but there was an unnerving scramble over a fence in the water at the Trout Hatchery. “Sky Boy is not the most conventional jumper and he’s got a long stride for the technical elements. This was one of those courses where you have to change your plan and make decisions on the spot,” explained the rider. It was a good day for family Price as Tim’s wife, Jonelle, is in third place, only 3.4 penalties behind him. Jonelle had a brilliant round on Classic Moet and was one of only two riders to finish inside the optimum time of 11 minutes 12 seconds. “My mare was pretty faultless from start to finish,” she said. Course designer Captain Mark Phillips admitted that he had intended there to be “two or three” inside the time – and so it proved, with Australian Christopher Burton being the only other rider to beat the clock on the thoroughbred TS Jamaimo. Burton was the first to achieve the time, on his second ride, and he has risen 17 places to fourth; he is also in fifth place on Haruzac, previously 11th after dressage. “He often starts out a little hesitantly, but today he raced out of the start box and felt really up for it and positive over the first few fences, so I thought I ought to give it a crack,” Burton said. Australian and New Zealand riders are to the fore, with Bill Levett (AUS) up 13 places to sixth on Improvise and Mark Todd (NZL) moving up five places to seventh on Leonidas ll, despite a scary moment when the horse dived at the corner fence at 15. “I had a couple of hairy moments because the horse was drifting left, which made the fences seem even bigger,” said the five-time Burghley winner who revealed that the German-bred gelding has missed work with an infection. “But he was so brave and I’m thrilled with him as it’s the biggest track he’s jumped, a good old-fashioned four-star course,” Todd said. The horse had pulled up feeling good, and Todd was hopeful he still had lots of energy for the showjumping. Fellow Kiwi Jonathan Paget was clear also, but had time faults. He and Shady Grey moved up the leaderboard from 34th to 24th. Frenchman Cedric Lyard is ninth after a good performance on Cadeau du Roi and Oliver Townend (GBR) is best of the British in ninth place, having been a brilliant trailblazer with his confident opening round on CCI4* first timer Dromgurrihy Blue. Townend was also last on course with the experienced Armada, and had the competition at his mercy, but an uncharacteristic mistake, a run-out in the Trout Hatchery, left the rider slapping his head in frustration and dropped him from fifth after dressage to 18th. Kristina Cook is next best Briton, in 10th on Star Witness, having survived a near unseating at the Trout Hatchery when she was hanging right out of the saddle. “I’m really proud. It’s always great to have a ride like this with a horse you’ve produced from nothing,” she said. “He was so honest and he helped me out.” They improved the best of all top 10 riders, moving up from 30th after dressage. Riders had been instructed at the competitor briefing to bear in mind the climb uphill to the huge Cottesmore Leap (fence 13) which came earlier than usual because the direction of the track had been reversed from last year. Seven of the top 10 riders after dressage dropped from the reckoning. Sam Griffiths (AUS), third on Happy Times, and Rosalind Canter (GBR), 10th on Allstar B, had run-outs at the Discovery Valley; Andrew Hoy (AUS), fourth, was unseated when Rutherglen glanced off the corner at Capability’s Cutting, and Niklas Bschorer (GER) had a refusal with Tom Tom Go 3 at the right-handed bounce out of the Anniversary Splash and retired. Top article thanks fo keeping us in the loop. Go Prices! !